Is your dog in training? Working? Reactive? Aggressive? Shy? Special needs? 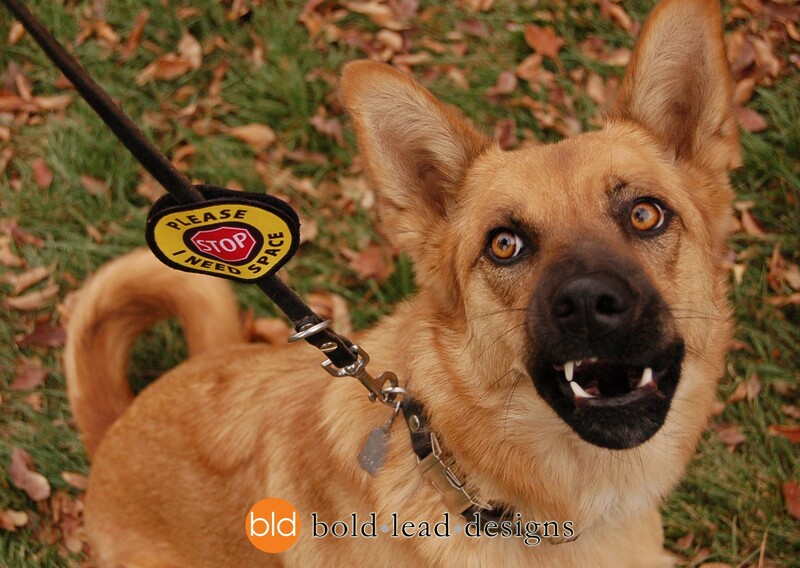 These two-sided leash wraps communicate a clear message of “STOP!” to reduce unwanted encounters. 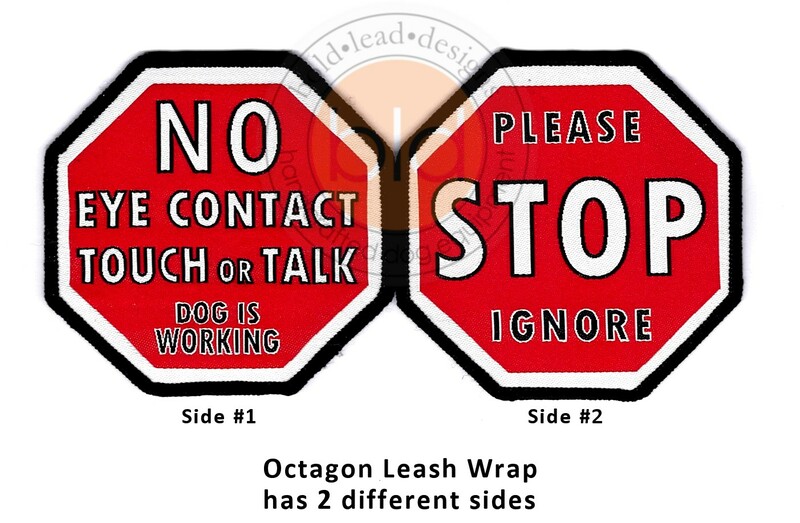 Each leash wrap is a PAIR of patches that attach back-to-back! 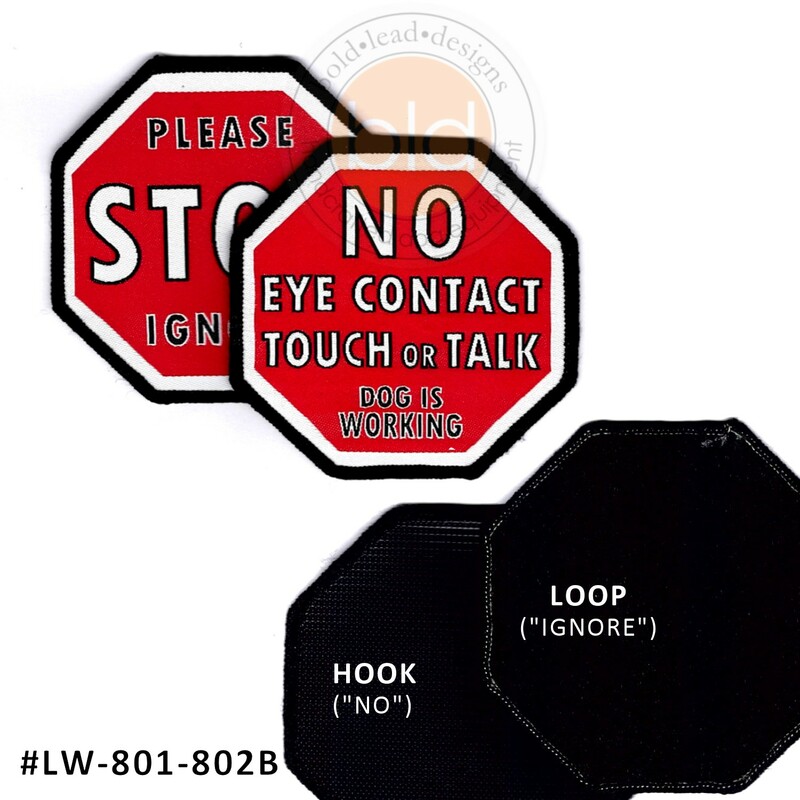 One patch has hook fastener, one patch has loop fastener. Made from woven damask material–the design is woven into the fabric! Can be a clip-on badge too! 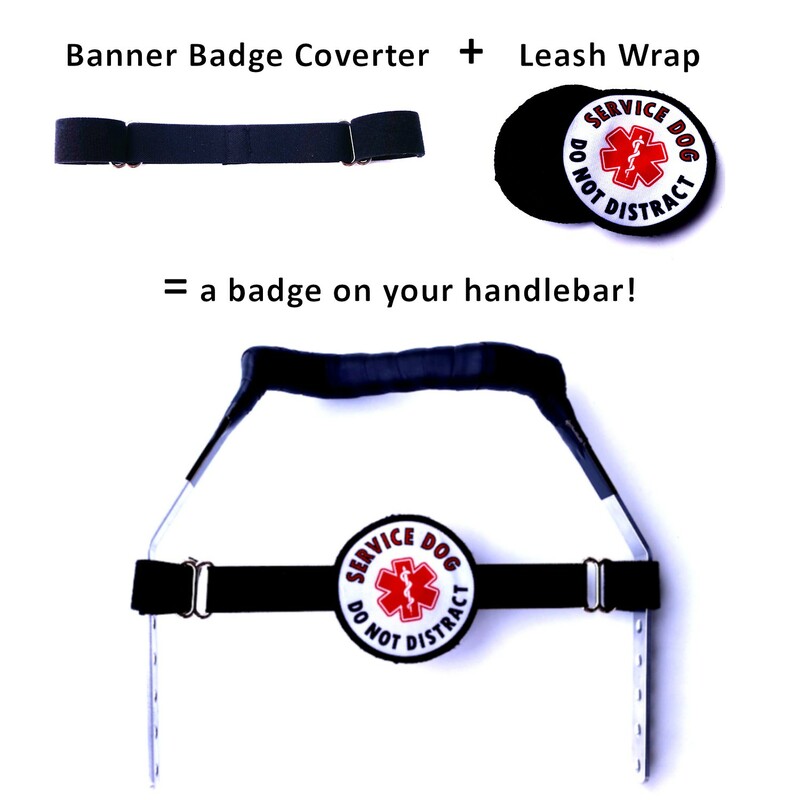 Just order the “conversion kit” and then you can clip it onto a d-ring on your harness or collar. 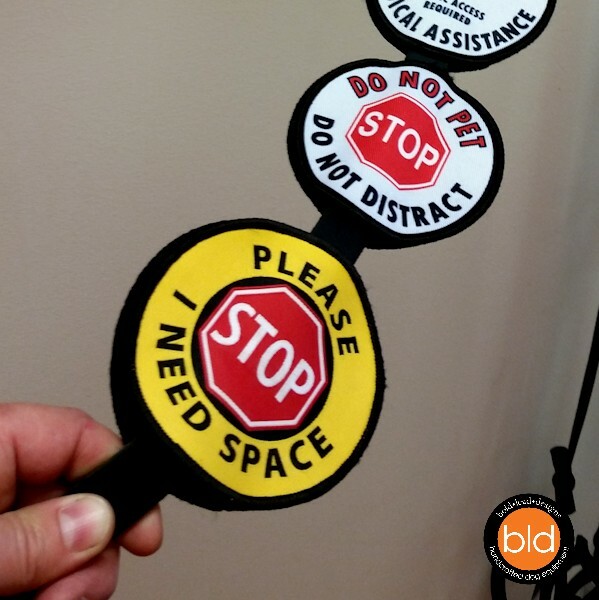 STOP / DO NOT PET / DO NOT DISTRACT. 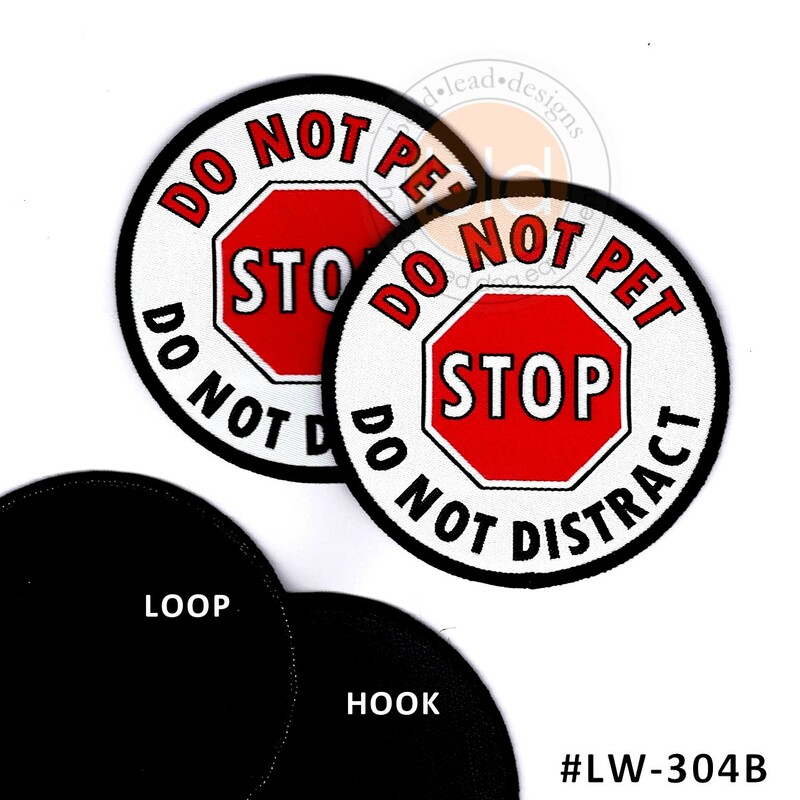 Circle patch is 3.25 inches in diameter (8.25 cm), features a simple and clear message. PLEASE / STOP/ I NEED SPACE. 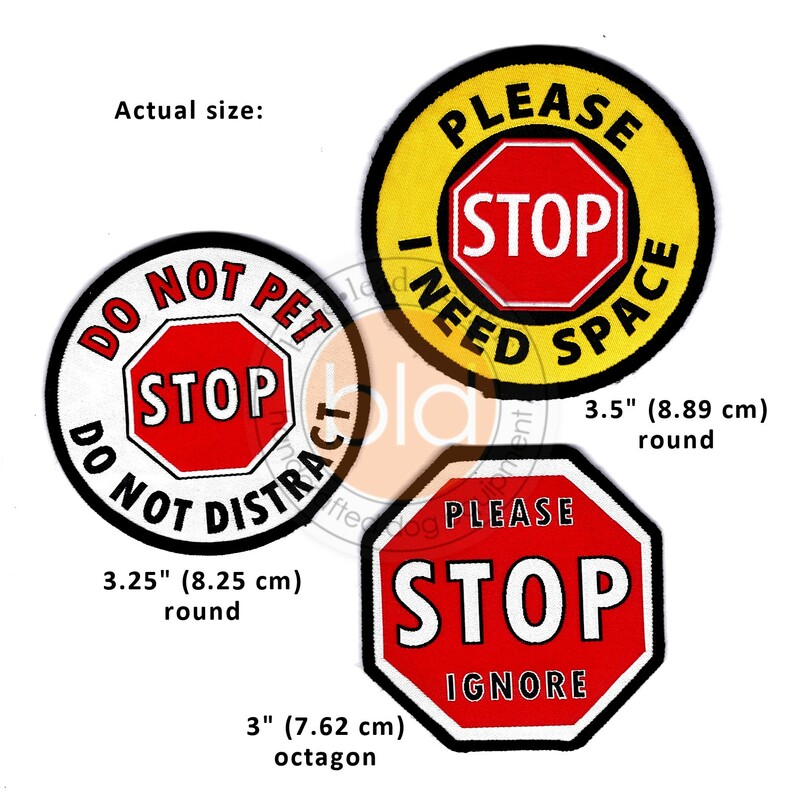 Circle patch is larger at 3.5 inches in diameter (8.89 cm), features caution yellow, red, and black color scheme. Please STOP Ignore/NO eye contact touch or talk/dog is working. Octagon patch is 3″ in diameter (7.62 cm), and features a different design on each side. Stock up with our PRO discount! Buy 6 and save 20% (discount will appear in shopping cart). BLD exclusive designs! We invented the “double patch” concept! Designed in Colorado. Imported. Make it a Clip-On or Banner Badge? On our first outing to the local pet supply shop and then a walk in the park, we had 3 people comment on the badge, and we discussed why one should not crowd a dog. More importantly, my dog got the respect she needed. Be prepared for engaging conversations! Facilitate respect for you and your dog! 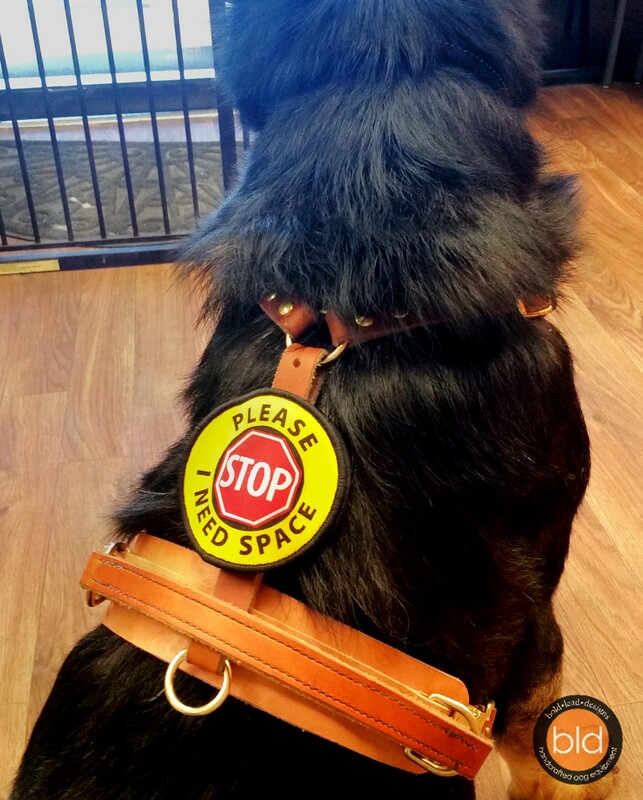 BLD’s leash wraps are designed to communicate a message to strangers who may not recognize your dog’s boundaries. Cear and legible designs are highly visible. The colors and STOP sign symbol are universally understood, even by children. Yes, they really work! 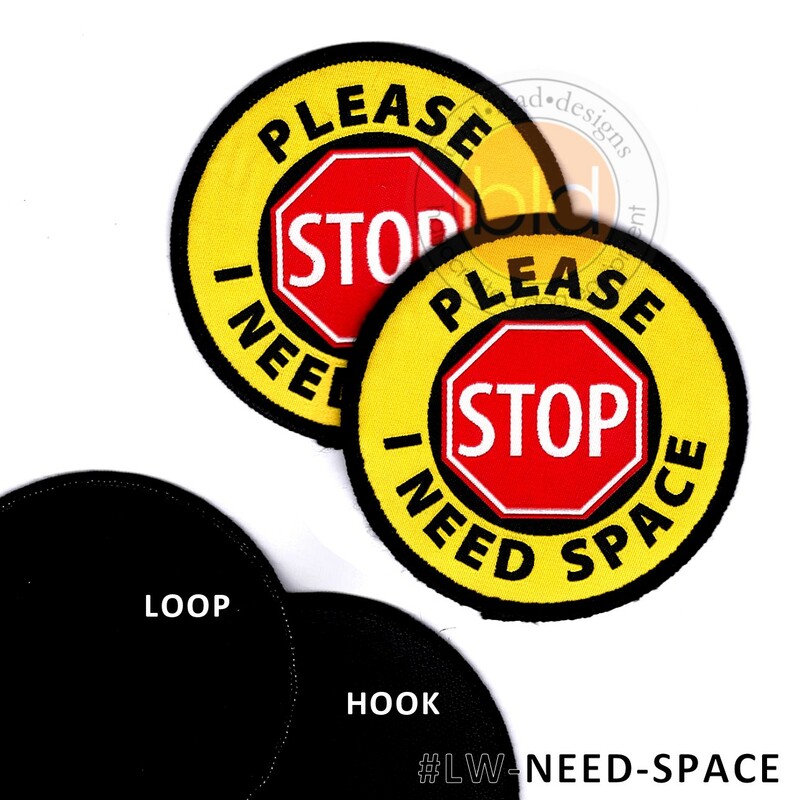 Each badge is a PAIR of patches: one has hook fastener backing, and one has loop fastener backing. 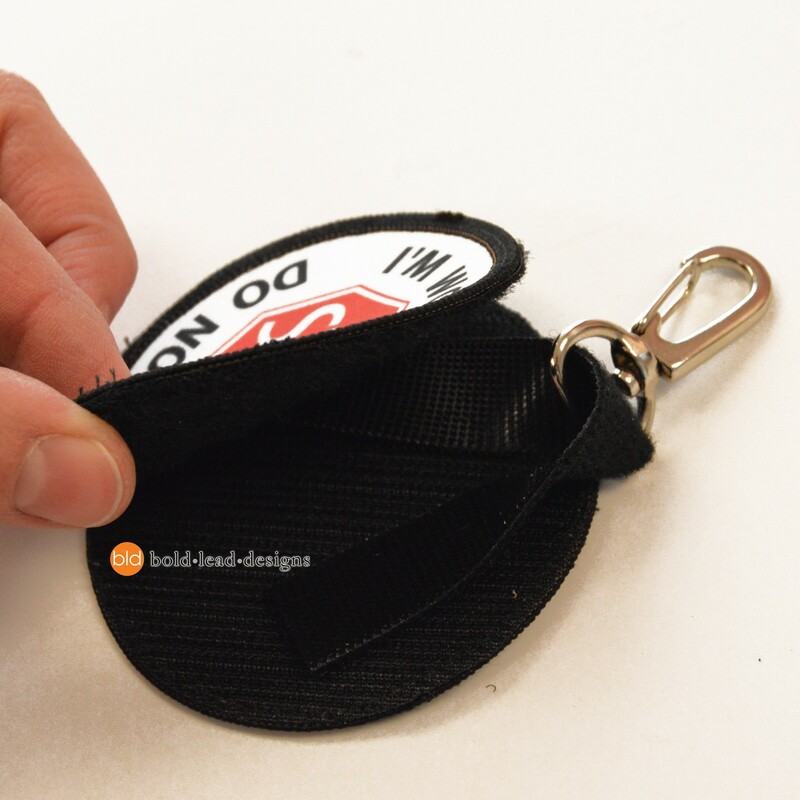 The patches attach back-to-back to wrap around a leash, harness strap, or a handle bar. Does not interfere with the use of your leash or harness! 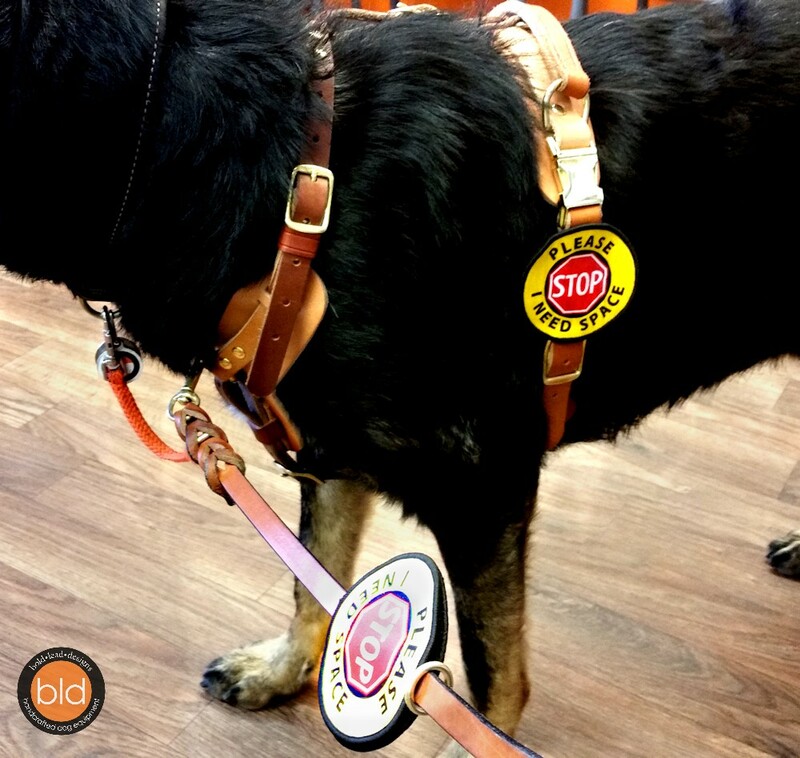 Specially designed elastic banner with Velcro strips attaches to the handle of any service dog harness. Simply put the Leash Wrap around the elastic, and voila! You now have a 2-sided banner badge! Elastic stretches to fit the width of the handle. Handcrafted in Colorado. 4 inch size: 4 inches (10 cm) of elastic, fits handles 6 to 8 inches wide (15 – 20 cm wide). 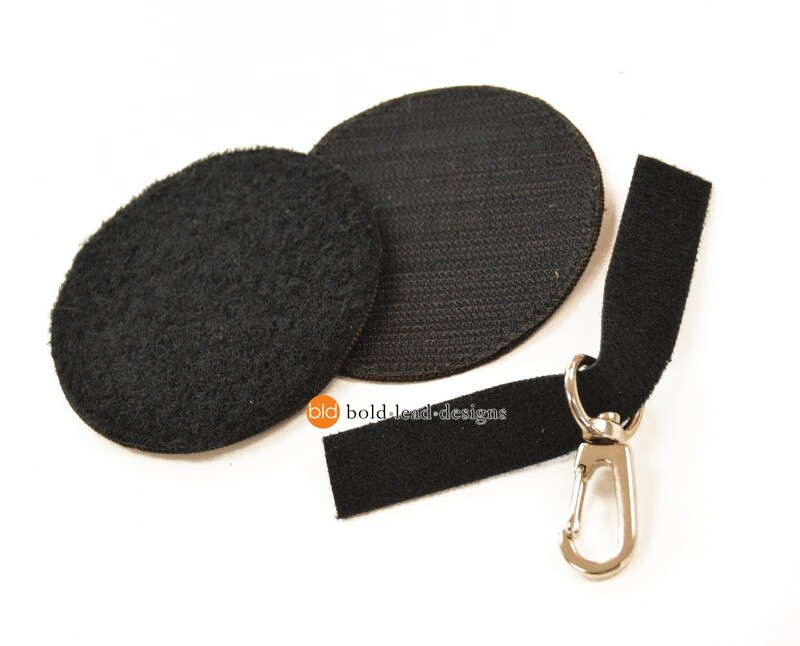 Use with BLD’s BAH leather handles, or other brands of harness bridge handles, or guide handles. 6 inch size: 6 inches (15 cm) of elastic, fits handles 8 to 10 inches wide (20 – 25 cm wide) . Use with wider rigid metal handles, such as BLD’s MSH. 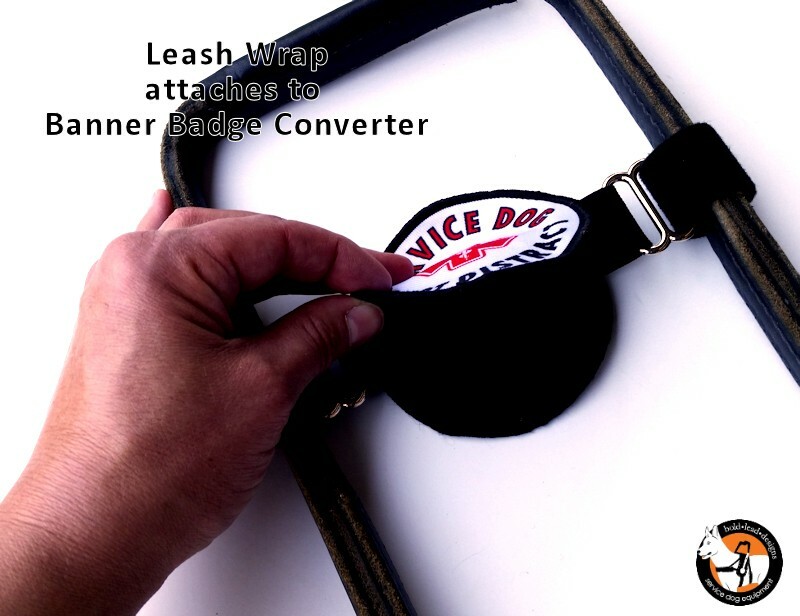 Need to clip this badge onto your collar or harness? Just order a “Clip-on Conversion kit” and you’ll be able to wrap it around your leash OR clip it onto a d-ring. Hand wash with dish soap as needed, if edges fray, simply use a lighter or match flame to sear the threads. Imported. 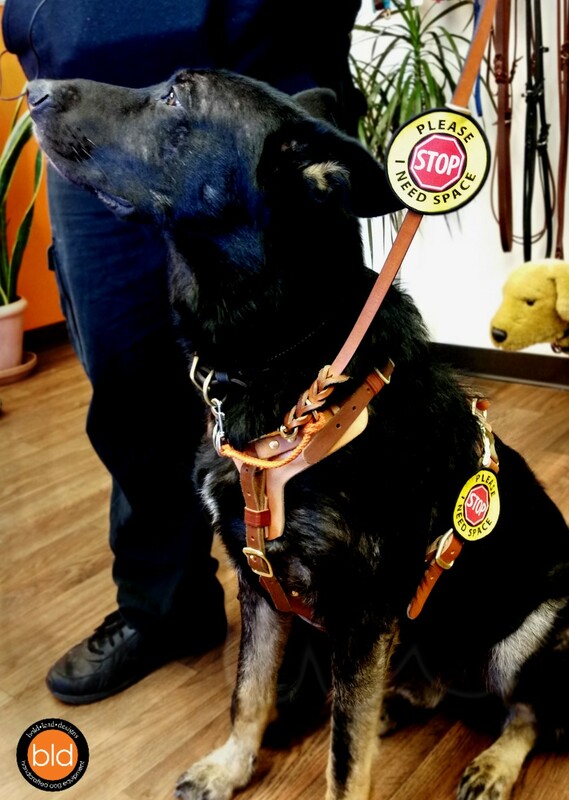 Looking for Service/Assistance Dog badges? Click here!